Getting to know Mollydooker wines is like getting to know the hottest guy in town — it ain’t easy. He’s a lot more popular than you are, so he can be choosy, and make you wait. I’ve been trying to get to know Mollydooker wines, but they’re maddeningly hard to get (because they sell out). I can’t find them at all in my home state — I had to have a single bottle delivered like a CARE package from the state next door. It was The Boxer, and it was great, and I wrote a story about it that you can read here. So I just about jumped out of my skin when I saw not one, but two bottles of Molly Dooker Two Left Feet 2008 sitting on a retailer’s shelf. They went home with me, needless to say, and I treated them to a Rib dinner. Before I talk about the wine, let me fill you in on the winery. ”Mollydooker” is another one of those wacky Aussie words, and it means “left-handed,” which describes Sarah and Sparky Marquis. This young couple are Australian wine royalty, having won everything from Australian Winemakers of the Year (several times) to five, count’em, five 99 point ratings from The Wine Advocate. They started out partnering with grape growers to create exceptional fruit, from which they made exceptional wines. Some of their early brands include Marquis Philips and Henry’s Drive, both of which win the ratings sweepstakes on a regular basis. There’s nothing new about the Fotinos family and their Pinot Noir. Their Carneros vineyards have been in the family for more than 40 years, and their Pinot Noir has been going into bottle almost as long. But it wasn’t always their bottle: for 33 years they private labelled their wine and sourced grapes to a slew of name-brand wineries. 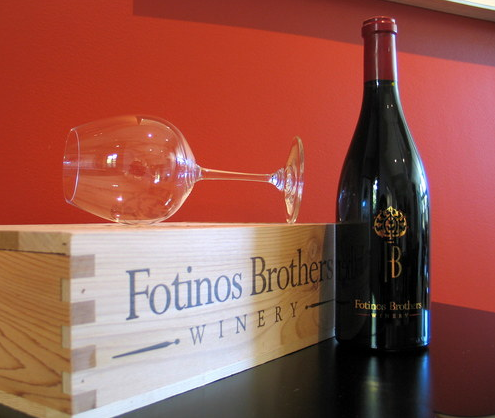 In 2006, the sons of the original Fotino created the inaugural vintage of Fotinos Brothers Pinot Noir. I was sent a bottle of the 2007 Fotinos Brothers Pinot Noir Los Carneros OSRII Block for review, and noted the impressive packaging right off the bat: 24 carat gold embossing screams, “Hello, I’m expensive.” But it could be just another pretty face, right? The wine poured out a soft rose color, and was almost translucent (I could read my notes through it). The color suggested very light body, but of course, the proof is in the smelling and tasting. The nose was stand-offish at first. I had to really work to get some delicate Bing cherry, and it was at that point that I realized this thing was gonna play hard to get. I poured a good slug more to get some volume going in the glass, gave it a hearty swirl, and then turned my back on it — “OK, be that way,” I said. Here we have it — more irrefutable proof that drinking wine is good, and drinking red wine is really good. A researcher named Dan Buettner studied cultures all over the world in order to write a book called, “Thrive: Finding Happiness the Blue Zone Way.” I have no idea what the Blue Zone is, but I heard him interviewed on The Splendid Table, a show I listen to on National Public Radio (also known as My Sole Source Of Information About The World). As it happens, though, I almost never hear a whole show on NPR, because I’m listening to it in my car, and when I get to where I’m going I step out of the car and miss the end — unless I have a “driveway moment,” and sit in my car looking like a dummy or a stalker until the show finishes. 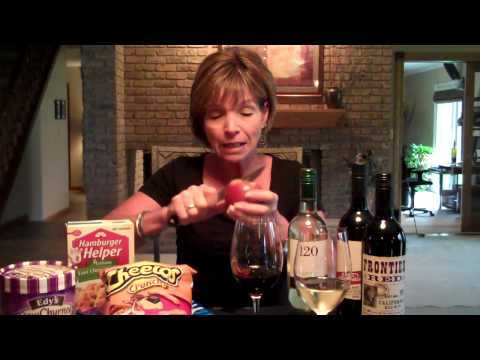 - eating a Mediterranean diet combined with red wine. Wow, I feel myself getting younger already. I’m gonna head to the market and load up on the freshest stuff I can find, break out the garlic and olive oil (well, I always do that anyways), and pop open a bottle of red wine. Oh wait, I always do that, too. Oh well, guess that means I’m gonna live to be 100, which is OK, as long as I can still drink wine in my nursing home. Cheers! Wine Doesn’t Have To Make You Fat!